Home :: Students raise big money for NYF! Students raise big money for NYF! As new members of Girls Learn at Marin Horizon School in Mill Valley, CA, Nina Kissinger, Vivien Manning and Hannah Platter searched for a project that reflected the club’s mission — promoting education and empowerment for girls. They found it in NYF, which has freed more than 12,000 girls from bonded servitude and is now helping them start new lives. The entire school community rallied behind them. For the past three years, the girls sold used books and home-baked cookies, babysat at the school’s Parents Night Out, and sweetened Valentine’s Day with candy grams, raising about $2,500 last year alone to help educate these freed Nepali girls. The girls matched that amount this year, plus the school donated the proceeds from its Read-A-Thon. Nina, Vivien and Hannah presented Olga with a check for $9,110 at our Founder’s Day event last week, money they hope will help girls freed from Kamlari to find their place in the world. “We’ve been committed to NYF’s work since 6th grade,” Nina said. “We hope to carry it on when we head off to high school next year. 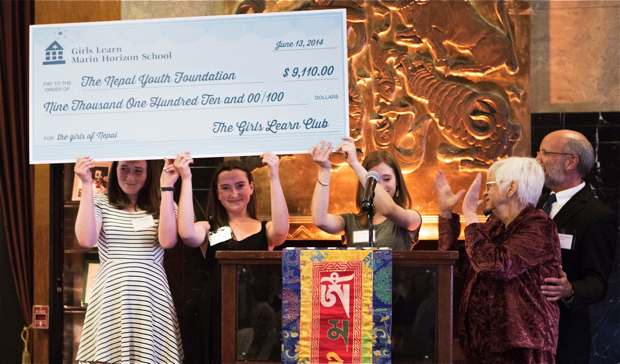 Many thanks to Marin Horizon School and Girls Learn for caring about the girls of Nepal!